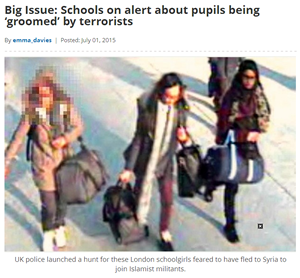 Extremism has suddenly arisen within the compounds of schools across the UK, and pupils are in danger if schools do not provide a channel to report such behaviour or activities. Safeguarding and protecting pupils should be a schools number one priority according to 86% of parents asked in a recent questionnaire. John Hayes, Security Minister and the Department for Education has recently outlined that all schools and staff have a duty to report incidents of extremism, radicalisation and safeguarding. Yet what measures are schools putting in place to protect pupils and staff against the latest safeguarding threat. Ofsted are focussing heavily on a schools ability to recognise, understand and report incidents of extremism and radicalisation. However services that support the school network are failing to provide adequate answers, resources and training to help schools deal with this new and ever growing threat. SLT teams are being expected to quickly become experts on this new safeguarding issue, yet without a guided support network, how can any school or member of staff be expected to provide the evidence and information required if they don’t know what this is. Pupils of the 21st Century are at much greater risk than they have ever been. The introduction of technology and social media, and the interaction between cultures has brought pupils closer together than ever before. In order for a school to protect their students is to engage and educate their students around the signs and dangers of radicalisation and extremism particularly when using technology and social media. One recent method that schools have been adopting to help protect their school pupils is to provide a communication channel to allow pupils to report any incidents of extremism that they themselves may be susceptible to. However a number of schools that have used a communication method have found that it has been most powerful allowing pupils to report and raise concerns for their friends or family members directly to their school. Proactive schools have found that tackling these new issues head on by engaging the wider community to educate have also proven to be an excellent starting point. This new safeguarding issue within schools is unfortunately one that is going to increase if schools do not put the relevant communication, reporting and action policies in place. Michael is the founder of Tootoot, the safeguarding application which allows pupils to report incidents such as extremism as well as bullying, racism etc. Find out more.